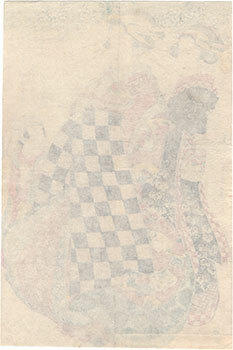 Important polychrome woodblock print of vertical large oban (大判) format made around 1830 by the famous artist Kikukawa Eizan (菊川英山). The protagonist of the work is the courtesan Tachibana (たち花), that is "orange blossom", of the Tsuruya (鶴屋) pleasure house, of which at the top right we read the address "Kyomachi Itchome" (京町壱丁目). 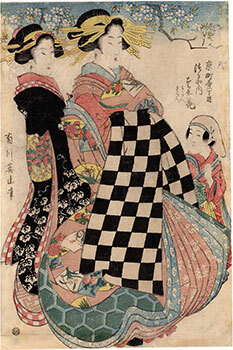 The woman is depicted under the flowering branches of a cherry tree, in the company of two young assistants named Sakon (さこん) and Ukon (うこん). Eizan (1787 - 1867) was the most prolific, longest-lived and ultimately the best of the late followers of Kitagawa Utamaro (喜多川歌麿), who attempted to carry on the style of the bijin (美人) beauties of the master after the death of the latter, occurred in 1806. 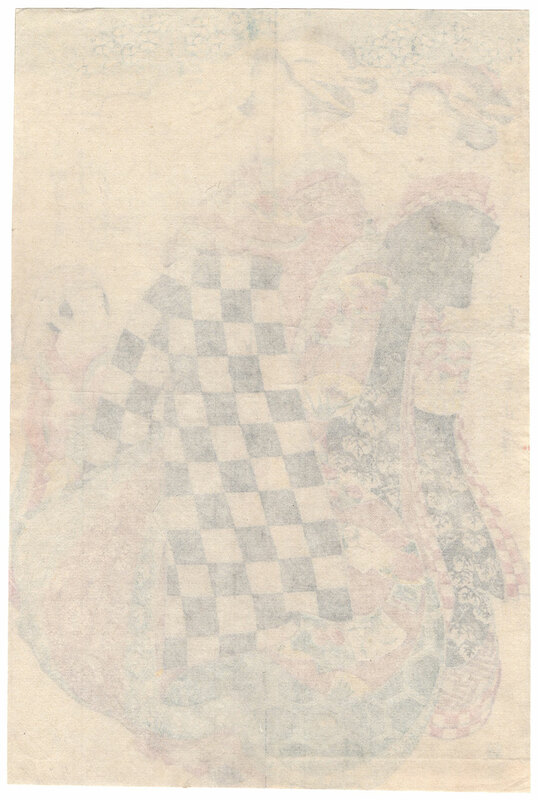 The precious print on Japanese washi paper (和紙) has the right signs of aging as well as a central cut that runs along the vertical line and, however, is in good general condition, thanks also to an effective relining carried out on the back.